Nelson Chamisa arrives to cast his vote in Harare on July 30. Zimbabwe’s main opposition party said it was well ahead in the first election of the post-Robert Mugabe era and it’s ready to form the next government, as unofficial results began streaming in. With official tallies set to start being announced on Tuesday afternoon, the focus now shifts to whether the vote was credible and the results are accepted, key pillars needed to rebuild the southern African nation’s international reputation and economy that was laid to waste under Mugabe’s 37-year rule. The jury is still out on whether the contest was fair, with observers raising initial concerns and the opposition alleging there’d been a deliberate attempt to frustrate and suppress urban voters. [post_ads]The front-runners for the presidency are the ruling Zimbabwe African National Union-Patriotic Front’s Emmerson Mnangagwa, 75, Mugabe’s one-time deputy and successor, and his main rival, Nelson Chamisa, 40, a lawyer and church pastor who heads the Movement for Democratic Change. The MDC’s campaign made headway over the past two months, tightening the race “significantly,” and if that trend continued victory could go either way, opinion polls conducted by research company Afrobarometer show. 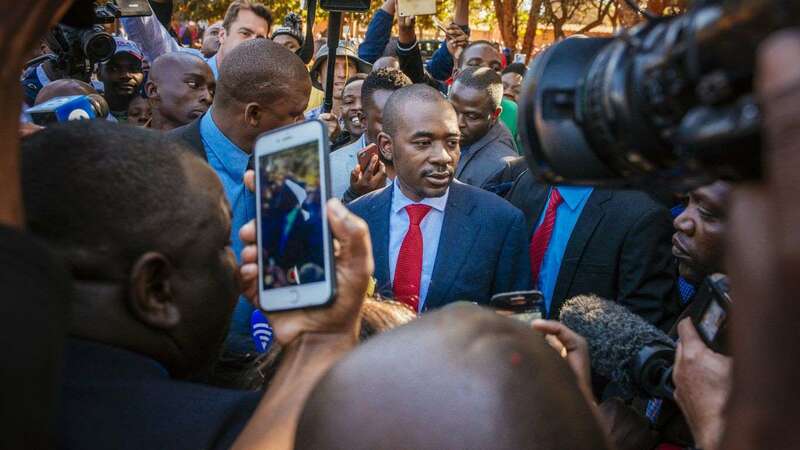 Chamisa said that based on his party’s own tally of unofficial results from more than 90 percent of the 10,985 polling stations, the MDC was “winning resoundingly.” The results still need to be verified and collated by the Zimbabwe Electoral Commission, which said it will start announcing tallies from 3 p.m. and complete the task before an Aug. 4 deadline. An election official directs a voter in Harare on July 30. Photographs of tallies posted outside some polling stations and shared on Twitter backed up Chamisa’s assertion, but aren’t indicative of the final result because they mainly came from urban areas, which are traditional opposition strongholds. More than 5.6 million people registered to vote for the president, 350 lawmakers and local government representatives in Monday’s election. The next ruler will have to administer an economy in meltdown after two decades of misrule and corruption under Mugabe, who the ruling party forced to resign in November, and a broke Treasury that’s unable to service its loans or take out new ones. That will leave little scope to improve government services, rebuild crumbling transport links and meet a plethora of other election pledges. “Investors are not necessarily looking at who wins, but how they win,” Neville Mandimika, an analyst at FirstRand Ltd.’s Rand Merchant Bank in Johannesburg, said by phone. More than 6,100 local and international observers were accredited to scrutinize the vote. There were no immediate reports of violence, said Andrew Makoni, chairman of the Zimbabwe Election Support Network, an association of 34 civil rights and religious organizations. Priscilla Chigumba, the electoral commission’s chairwoman, said voting proceeded peacefully and went well overall, with turnout ranging from 60 percent to 80 percent in provinces where the data was available. About 1 percent of people were turned away for various reasons, she told reporters late Monday after polling stations closed. 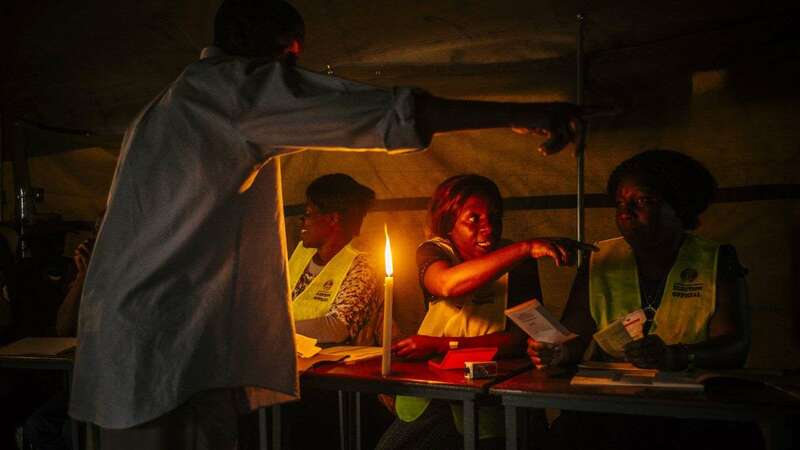 The Election Resource Center, a Harare-based pro-democracy and research group, said the voters’ roll used at polling stations was finalized on June 1 and printed on July 4, and was different to the one that the electoral commission had circulated in advance — which explained why a “significant number” of people couldn’t cast ballots. Mnangagwa has insisted the election will be credible.